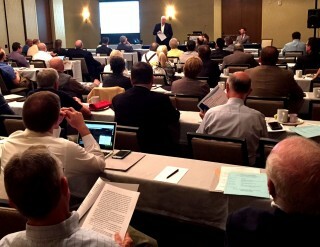 More than 150 Municipal Court judges from across Tennessee attended seminars this week in Knoxville, Nashville and Jackson. The judges attended workshops on ethical duties, codes enforcement and heard from the Board of Judicial Conduct. While generally, a municipal court can impose a fine of up to $50 (Fifty Dollars) plus court costs for violations, in some instances, these courts can impose a civil penalty of up to $500 (Five Hundred Dollars). The officials of a municipal court are the municipal judge and the municipal court clerk, who may both be appointed by the city’s governing body, or in some instances, one or both may be required to be elected. 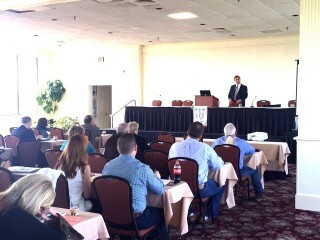 Judge Gregory Smith, Cheatham County, addressing the Knoxville seminar April 11th. Tim Descenza, Tennessee Board of Judicial Conduct Disciplinary Counsel addressing the Nashville seminar April 12th. A panel of municipal judges discussing Codes at the TMJC seminar in Nashville, April 12th. 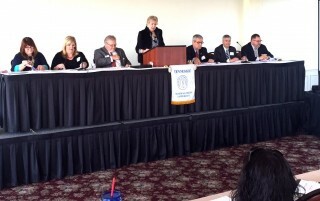 (left to right) Judge Lynda Jones, Nashville, Judge Barbara Medley, Lewisburg, Judge Paul Plant, Saint Joseph, Judge Blair Morgan, Spring Hill, Judge Chuck Doerflinger, Loretto, Judge Ben Boston, Lawrenceburg, and Judge Thomas DuBois,Columbia.